This week the Elephant Parade QAL hosted by Lorna @Sew Fresh Quilts gave instructions for the sashing, borders, and backing. But I couldn’t stop there – once the quilt top and back were ready to go, I got it quilted up and finished! 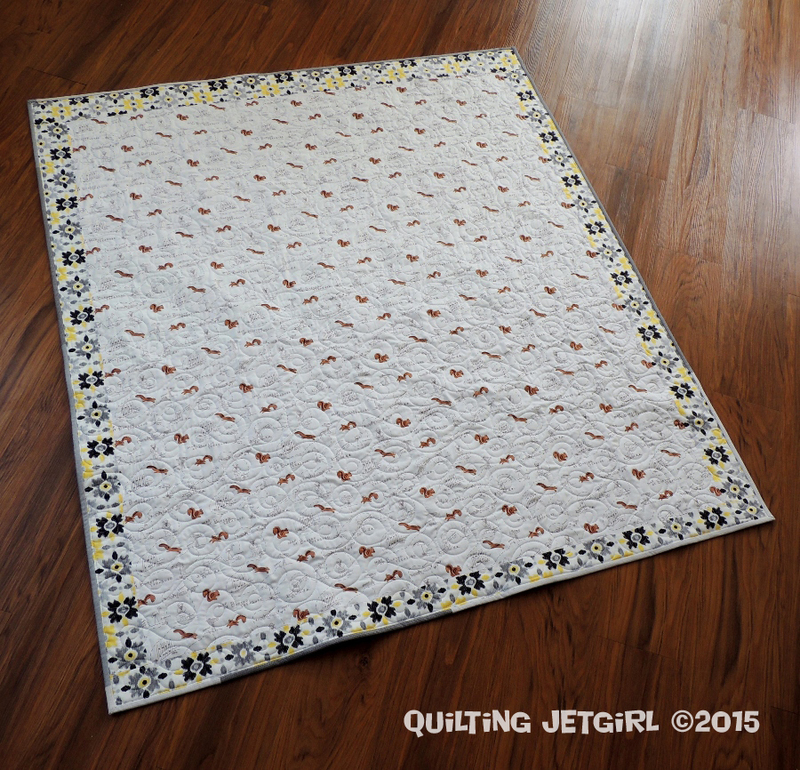 It was a super fun QAL, and I am thrilled with how the quilt came together. As you can see, I went with a scrappy gray binding. I used up the last of the gray fabrics I had purchased for the quilt to use in the elephant blocks, and I used a third gray print that I had left over from a baby quilt I made last August (yay for using up scraps!). So let’s talk about the quilt backing for a moment. I had some super cute fabric left over from an “I Spy” baby quilt I made in 2012. I had been waiting for just the right project to use up the fun print, and I think it works great as the backing here. The print was not quite large enough on its own, so I used up the last of the backing scraps from my Foothills Mystery quilt backing, too! I used 50 wt Aurifil 2024 (white) to quilt an all over looping meander. I took a look at how long I had spent on the quilt and was surprised to see how much time it took to make the quilt top, so I decided to go with a quick all over design. Plus, I really love some of the fabric choices and did not want to take away from how awesome the prints are for the elephants (don’t they look wrinkly?) and for the turtle (I love his shell!). Quilt Shrinkage (I used Quilter’s Dream Green batting). Thank you so much, Lorna, for the fun Quilt-A-Long, and I look forward to seeing how everyone else’s Elephant Parade projects finish up! You can visit my previous posts about the Elephant Parade QAL for more details on the process. Linking up to Can I Get a Whoop Whoop and TGIFF hosted this week by Aylin @ ayliN-Nilya (buttons to the right). You have inspired me! I made five elephants today into a humidicrib cover! I haven’t yet figured out how to quilt it, but your swirls are looking good and I lack imagination. Expect a copycat attack. 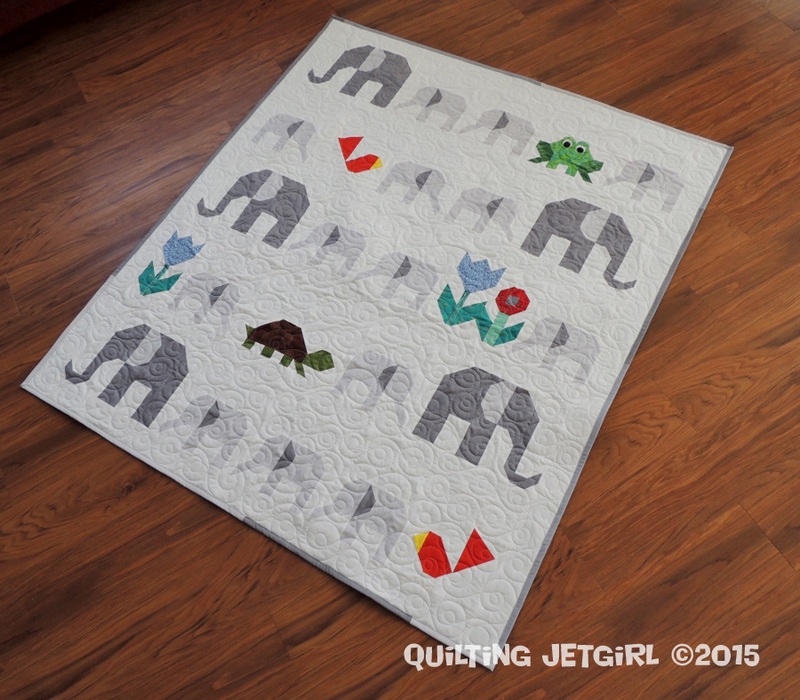 Your Elephant Parade quilt is perfect, Yvonne! The loopy quilting makes for such a fun pattern. And that backing fabric is adorable! I am so happy to have you quilt along. Thanks so much for joining in the parade! absolutley gorgeous! I love all the choices you made from fabric to quilting. that backing fabric is adorable! I love that you included shrink stats! I haven’t seen them before, but it’s good to know. This is such an adorable finish. Scrappy bindings are my favorite – yay for using up your scraps on the binding and back! such an adorable design! and your quilting looks delightful. have a great weekend! It came together beautifully! I think the all over loops look great, and I love the fabric choices! This is so lovely Yvonne! I love the little pops of color from the non-elephant pieces. It’s so beautiful, sophisticated, and modern! Great finish! Love that backing and so perfect for this quilt! Using the gray for the elephants and the bits of color makes me so happy! Gorgeous and great job! Your elephant parade came out wonderfully. I like your fabric choices especially the textures in the animals. The squirrel fabric on the back is to die for cute too. It turned out great Yvonne! So adorable – I really love this design and you did a great job on it. FUN! I have a young friend who was recently diagnosed with earlier onset Alzheimer’s. Elephants are known to “never forget” and ALZ national color is purple, so she is using purple elephants as logo for fundraising (The Longest Day June 21st). I am soooo excited to see this. I love the pattern & hope to do something with it to benefit Alzheimer Awareness and show some love to my sweet friend! Thanks so much for sharing. The loopy swirls were a great choice. Such a sweet quilt, and you did great using up what you had. Yeah for stash busting! Oh my goodness that parade is simply adorable! Love love love it! And the gray just brings out the animals so perfectly. Thanks for sharing! That backing is seriously the cutest thing ever!!! From far away, it just looks like squirrels, but seeing it up close, I LOVE the b/w details! Hilarious. 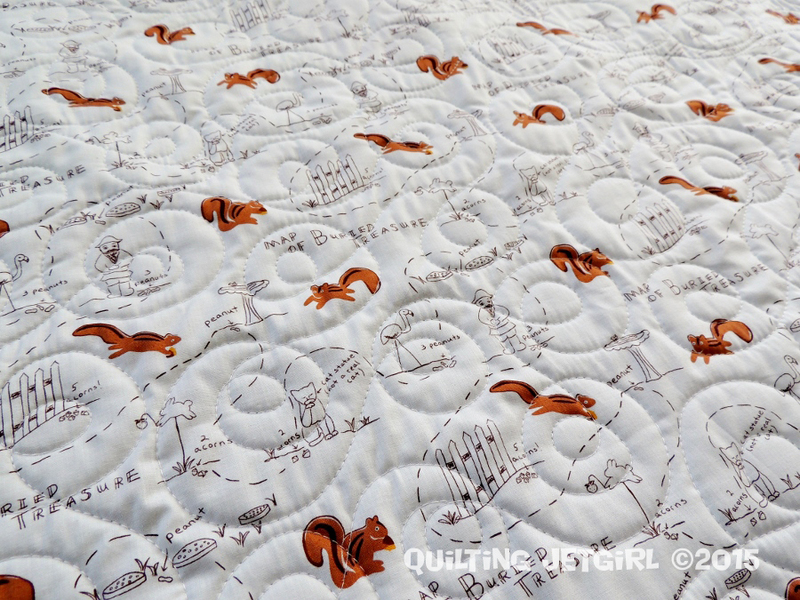 I could see myself following along with the squirrel’s adventures for quite some time looking at the back of that quilt. It turned out fabulously! While quilting my Dr. Seuss quilt, I was reflecting on the fact that I for some reason am stuck with quilting each portion of a quilt individually. I do love the way it looks, but ultimately, it would be WAY faster (and probably also look awesome) to do an all-over quilting pattern. I’m not sure my brain could do that, though. Do you find it tricky to see past the details of the quilt when you’re doing your all-over pattern? I may have to try it soon, just so that I know it’s possible with my brain. I color inside the lines, and I’m finding it tricky to break outside of the lines with my quilting, too! It really is a fun quilt along! Such a great design and I love how your Elephant Parade turned out Yvonne! What cute backing fabric! And your quilting – I love that too. I have not decided yet how to quilt mine. 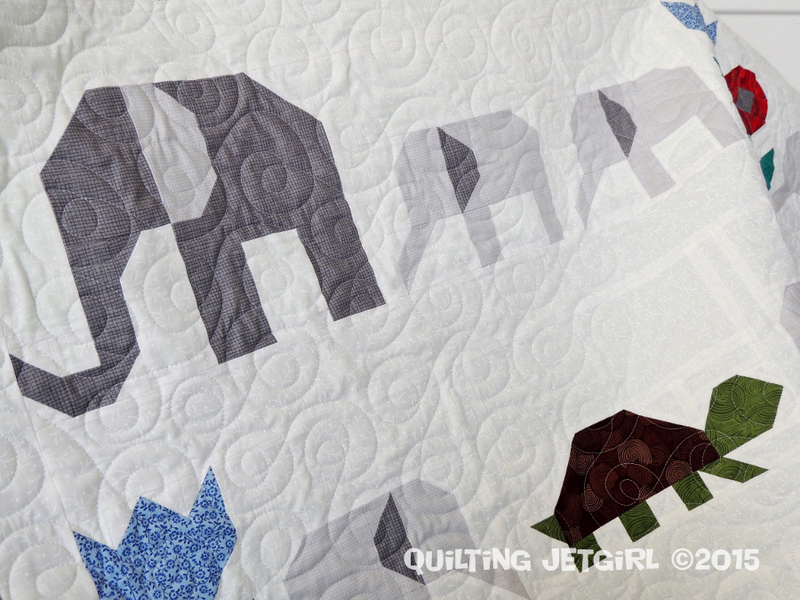 I really like seeing how all the QAL participants put their own stamp on the Elephant Parade quilt. I like the contrast between the delicate gray of the babies and the darker gray on the bigger elephants on yours. And the back is so fun–especially with that border corralling all those squirrels! I looks great. I like how the little elephants are a lighter value and more subtle, which draws out the other elements. 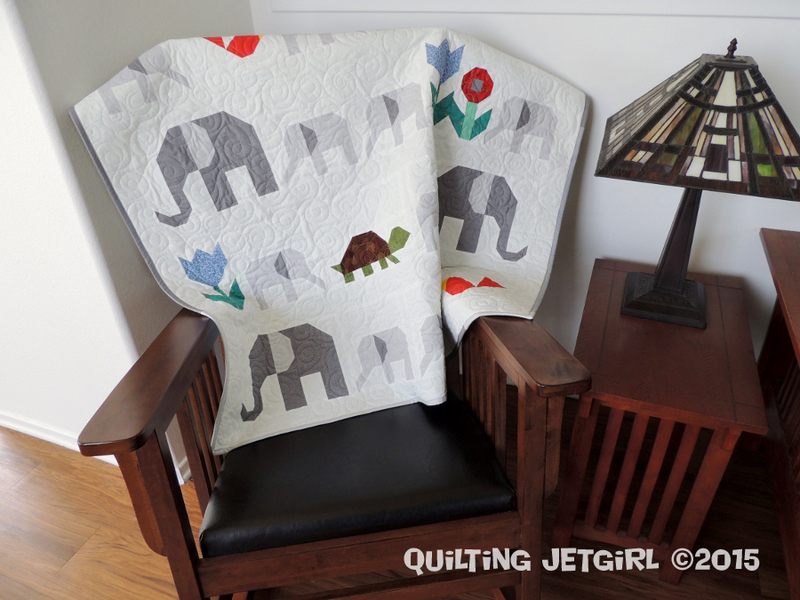 I really like all the Elephant Parade quilts that are around at the moment. I especially like some of the details on yours – your back is seriously cute and the scrappy binding is perfect. Lovely quilt. I like how you finished up your parade! Do you long arm quilt for others? Darling….and I love that backing fabric. I have some in my stash somewhere and now feel the need to use it…immediately. I’m here from Lorna’s blog. I love the turtle especially, with the two colors. Very inspired. Now that I am here, I also love the fact that you kept the stats for how long it took to make. I’m not organized enough to do that, since I tend to take a lot of breaks. The quilting does help make this quilt special, and the backing is perfect. I’m glad you were able to use your stash. What a gorgeous quilt! It turned out to be so pretty ! so adorable! i really like your version of it! so sweet. are you planning to keep? sell? gift? I love your finish. The colors you used are so pretty! This is so adorable. I’ve been trying to resist this but I don’t think I can. I need to make one!! I love this quilt top and everyones is turning out super cute! I love this to pieces! Worth every bit of work, effort and love! Congratulation Yvonne to this great quilt, is it beautiful! Very beautiful! I love your version. Your quilting is the perfect compliment adding texture while not detracting from the wonderful piecing. What a perfect baby quilt, so much to look at but so cute too, and still modern and light and airy.. Love that backing fabric as well.